Part of London Bridge, showing the heads of traitors on display. University of Victoria Library. London first achieved prominence under the Roman occupation, though there is evidence that there were earlier settlements on the site. The most notable remnant of Roman London (Londinium) is the London Stone, probably a Roman military stone. In 1450, Jack Cade struck it and declared himself "lord of the city." By Shakespeare's time, the city had grown substantially and suburbs had developed around the remains of the Roman wall. Across its long and rich history, London has seen numerous invasions. The Romans, the Danes and the Normans have all, at one time or another, settled in its walls. Under William the Conqueror and the Normans, London first acquired its status as capital. Norman London was characterized by religious houses and churches which were later destroyed or secularized under Henry VIII. St. Paul's Cathedral and the Tower of London both date back to Norman times, although St. Paul's was rebuilt after being struck by lightning in 1561, and again after the Great Fire in 1660. The Tower remains a monument to Norman architecture. London had been an important trading center from its early days and it would eventually surpass its rival Antwerp as the most important center in all of Europe. London's guilds had a central role in ruling London; for one, they controlled citizenship, which required seven years' apprenticeship and guild membership. The proximity of the royal living quarters in Westminster also provided enhanced prestige and opportunity, as the court employed many tradespeople. London's mayor was generally regarded as the second most powerful man in England, after the king. London city drew protection from the Roman wall, stretching from the Tower of London in the east to Fleet River and Blackfriars in the west, and London Wall Street to the north. To the south, of course, flowed the Thames river. A ditch followed the outside of the wall and large gates gave access to the main roads. At night and in the event of an attack, the gates were shut, making the city almost impenetrable. The original gates survive in street names (Aldgate -- "old gate" -- for example). The River Thames was known as "the great highway of London." The river was covered in light boats and state barges (used by the nobility for ceremonial purposes). Licensed watermen hired out their boats to the cry of "Eastward ho!" or "Westward ho!" and were notorious for their foul language. State funerals, royal pageants and civic ceremonies were common occurrences on the river and provided occasion for grand shows of splendour. The river was also an important means of transportation for trading goods to and from London. 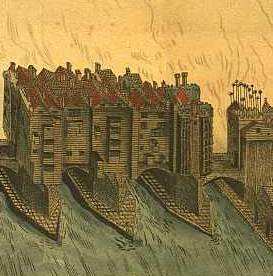 London Bridge was travellers' main access to London city. Its southern gates also served as a warning point to those who would threaten the authorities: heads of traitors, impaled on sticks, were displayed above the gates. The bridge itself was home to many shops and beneath, watermen had occasion to show off their boating skills weaving through the narrow arches*. The Bridge also had substantial historical significance: in 1450, Jack Cade entered the city by it. In another turbulent moment of England's history, Sir Thomas Wyatt marched on London in 1553 to protest Queen Mary's marriage to Philip of Spain. His plan failed when he could not access London Bridge; the draw-bridge had been cut down and the gates shut.